The Cougars found themselves a home. Amid the constant turmoil found during this extended period of conference realignment, Chicago State has managed to go from the schedule conglomerate of the Great West to an actual conference in the WAC. (Let’s ignore the fact that the WAC would lose its automatic bid if the historically black university didn’t join its ranks.) Granted, the Cougars are 0-8 in Division I play this season, but their campus lies atop a recruiting hotbed, and they could easily snag many a player who falls through others’ cracks, especially now that they offer the same chance at an automatic NCAA Tournament bid that about 250 other schools promise every season. This move makes sense for both parties, but it should help save Chicago State from the fate of Winston-Salem State, another HBCU that tried to make the move to Division I but failed before retreating back to Division II. Hamilton Hasn’t Been Smiling Much This Season (Photo Credit: Glenn Beil / Democrat). 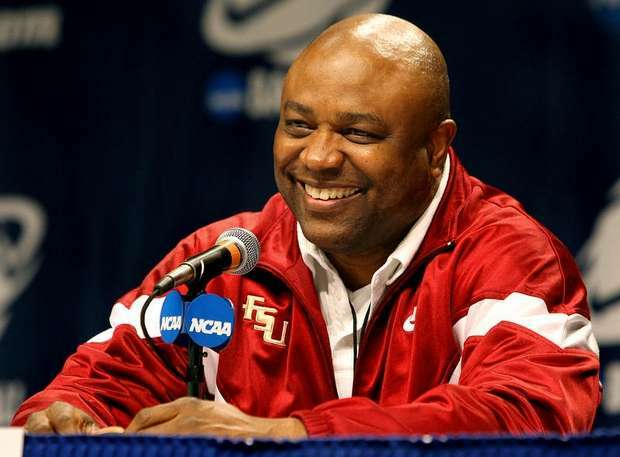 The Seminoles have had an extended run of success in the Atlantic Coast Conference, one unseen for that program since the Hugh Durham era in Tallahassee, but that’s threatening to fall apart in Leonard Hamilton’s 11th season roaming the Florida State sidelines. FSU is currently riding a three-game losing streak, and last week’s losses to Mercer and Florida were both ugly in their own ways. Falling 61-56 to a team from the Atlantic Sun is ignominious in its own right, but especially so for a team riding a school-record four-year NCAA Tournament streak. Having only one player score more than seven points in the process is even worse. But the Seminoles actually managed to one-up that loss with an embarrassing 72-47 loss to rival Florida, this time where no Florida State player scored more than 10 points. Michael Snaer, the scoring guard who helped lead the team to three wins in the last two years in the NCAA Tournament, scored 17 points between the two games on 5-of-17 shooting while having five assists and seven turnovers. This is foreboding for a team many picked to finish in the top half of an ACC that has often looked lackluster during the start of the season. Danny Spewak is the RTC correspondent for Sun Belt Conference and a Big 12 microsite staffer. 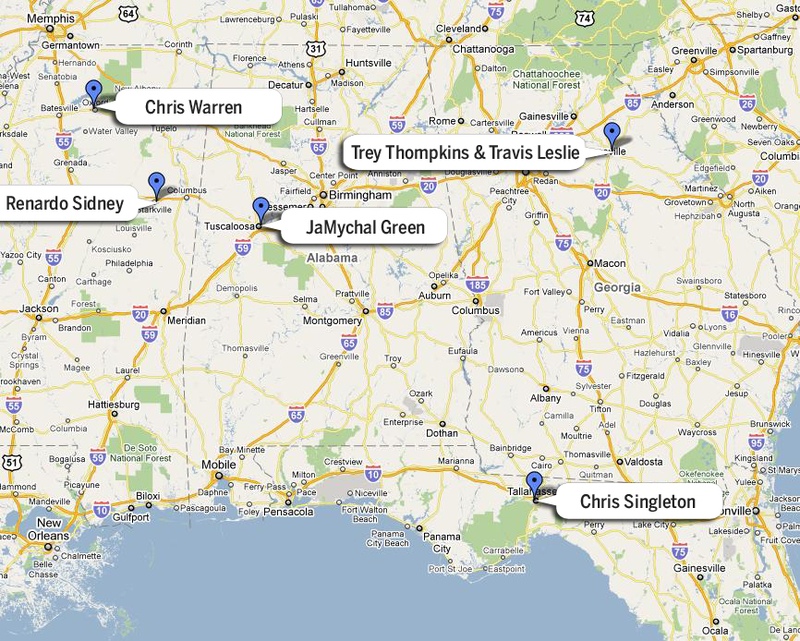 You can also find his musings online at www.sunbeltbasketball.com or on Twitter @dspewak. Blue Raiders > Blueblood: Middle Tennessee came to play this November. The Blue Raiders quietly earned a solid season-opening victory over Austin Peay, a favorite in the Ohio Valley Conference. Two days later, it knocked off Loyola Marymount—and then, the Blue Raiders earned one of the more significant victories of Kermit Davis’s tenure by blowing out UCLA 86-66 on Tuesday night. Iowa State transfer LaRon Dendy dominated the Bruins, who played without star forward Reeves Nelson, and MTSU’s famous defense held UCLA in check. Most impressively, the Blue Raiders made 10-11 three-point attempts. Even Davis wasn’t quite sure how to describe the performance: “it was a perfect storm tonight,” he said. Arkansas State Sputtering: The start of the season didn’t fare so well for the Red Wolves. After losing all-conference forward Martavius Adams to dismissal earlier this fall, ASU fell by three points to Lamar and then got embarrassed by Missouri State in a home blowout. John Brady’s team didn’t start very well last year either, and it still finished with a share of the Sun Belt West title. But the Red Wolves have a long way to go at this point, but maybe they started to turn it around last night with a win over UT-Martin. Owls Struggle Out Of The Gate: The consensus favorite in the Sun Belt, Florida Atlantic, may be 1-3, but it looked very competitive in those two losses to solid Portland and Washington teams. FAU even nearly completed a double-digit comeback against the Huskies, cutting the lead to four before eventually falling short. The trouble came Wednesday night, when the Owls went cold from the field in an ugly loss to American. Again, it’s early; too early to make any sweeping judgments. These are the same players that dominated the East division last year, so we’ll cut them some slack for now. Dennis Harris wants a reunion with John Brady. Harris, who signed with Brady at LSU and remained at the school when Trent Johnson took over in 2008, announced his decision to transfer to Arkansas State earlier this month. He appeared in only four games this season, but saw significant minutes as a role player last year. His 6’11 frame and long wingspan has to frighten opponents in his new league, especially since Harris will play alongside Martavius Adams when he becomes eligible in the spring of 2011. It’s not often we get to relay a human interest story to our Sun Belt fans, so let’s take this opportunity to recognize Denver guard Kyle Lewis for his heroic actions this month. According to Fox Sports Rocky Mountain, Lewis encountered a man in need of medical attention while walking on campus and called 911. Lewis told a sideline reporter for the television network that he actually kicked the man in the chest to resuscitate him. Lewis, named a team captain this year, had started for three seasons before taking on a bench role this year as a senior. So he’s an unselfish guy in more ways than one. The exact reason for Arkansas-Little Rock coach Steve Shields’ suspension for a home game against Louisiana-Monroe January 12 hasn’t been released by either the Sun Belt Conference nor the athletic department itself. All we know is that the league wasn’t too happy with Shields’ antics after a heartbreaking overtime loss at Denver in early January, won on a late three-point play by Chase Hallam. Shields only missed one game, and his team shook off the suspension with an easy 81-50 win at home. Where in the world did Troy come from? After losing five starters from a division championship team, the Trojans stumbled to a 2-13 start. That’s when Mo Weathers and Vernon Taylor decided they’d had enough. The two guards fueled a home win against Western Kentucky January 13 and made it two straight by shocking North Texas 89-81 two days later. The whole team deserves a shout-out, but we’ll focus on Weathers and Taylor in particular, who are thriving in coach Don Maestri’s up-tempo style. Taylor, who’s becoming a league favorite thanks to his creative Fresh Prince-like hairstyle, scored 20 against WKU and 22 against the Mean Green. Weathers didn’t make that much noise in non-conference play, but since the middle of December, he’s been unstoppable. Weathers has dished out more than 10 assists on three different occasions and shot 60 percent from three-point land in those two SBC wins. Sun Belt Network commentator Dave Odom, an accomplished college coach at Wake Forest and South Carolina, said he hasn’t seen a single guard in this league better than Weathers yet. We’ve followed UALR’s point guard situation throughout the season, and it’s safe to say now that Shields has two fine options in D’Andre Williams and Chuck Guy. And although Williams deserves a shout-out for leading the team in assists, it’s Guy who’s added a new element to the team in his freshman season. He’s scored in double-figures in each of his past five outings, and he’s lighting it up from beyond the arc—during those contests, he’s shooting almost 52 percent from three. 1. Florida Atlantic (14-6, 6-0): These Owls are for real. Of course, we’ve known this for weeks now. But we really know it now, especially now that FAU hasn’t lost since before Christmas. Most recently, Florida Atlantic dismantled Western Kentucky team at Diddle Arena by jumping on the reeling Hilltoppers immediately and never looking back. The most impressive thing about this team is how well it’s defending and how patient it’s been on offense. One of the youngest teams in college basketball last season, the Owls are growing more mature by the day. That’s due in large part to the consistency of point guards Ray Taylor and Alex Tucker, who are helping leading-scorer Greg Gantt get shots. Mike Jarvis has taken this group of youngsters and coached them into a disciplined team, both offensively and defensively. Now, FAU can show this improvement to a national audience Saturday against Arkansas-Little Rock, televised on ESPN2. 2. Florida International (8-10, 3-3): After racing to a 3-0 start with wins against the bottom of the league, FIU is back to earth after facing the Sun Belt’s top competition from the West. The Golden Panthers have dropped three straight games to North Texas, Denver and Arkansas-Little Rock, all of whom are in the mix in the West Division. FIU hung with UNT and UALR for the most part and fell to overtime against the Pioneers with DeJuan Wright sidelined, so it’s not as if this team was overwhelmed against the other division. There’s still work to do, most notably on the defensive end. 3. Middle Tennessee State (8-11, 3-3): It’s another typical Kermit Davis team in Murfreesboro this season. Although the coach is often criticized being for unable to take Middle Tennessee State to an elite level, there’s no denying his consistency. In 2010-11, he’s got another scrappy team with the ability to compete with anyone. MTSU already knocked off North Texas, and the Blue Raiders evened their league record to 3-3 by cooling off Troy Thursday night with a 63-51 win at home. If James Washington continues to lead, this team won’t go away. 4. Troy (4-14, 2-4): The Shout-Out section covered most of Troy’s emergence, but we can’t understate how surprising the Trojans’ two wins against WKU and North Texas were. The first was understandable—after a slow start, Troy slowly crept back into the game and demoralized an emotionally crippled Western Kentucky squad. The win against UNT came out of nowhere. Don Maestri has this team playing with a new kind of energy, and offensively the Trojans couldn’t be stopped against the Mean Green. Troy suffered a setback last night in a road loss at MTSU, but after a 2-13 start, a two-game winning streak in conference and a convincing win against the defending champs is a miracle. 5. Western Kentucky (6-11, 1-4): It’s finally happened: Western Kentucky has won a Sun Belt Conference game. It only took about a month, right? With rumors swirling about coach Ken McDonald’s job status, WKU found a way to win at South Alabama last night by nine points, but it wasn’t easy (what else is new?). The Hilltoppers nearly blew a 24-point second-half lead during a second half collapse. If there’s one thing WKU has done well consistently this year, it’s been offensive rebounding—and the Toppers dominated that statistic Thursday night. The victory is at least a start for this squad during this nightmare of a season. At the very least, it’s never seemed as if WKU has just plain quit at any point this year. Even among all the losses, Western Kentucky has always shown small spurts of greatness. A full 40 minutes just hasn’t materialized yet. 6. South Alabama (7-10, 1-5): Hopes of a bounce-back season have all but faded for Ronnie Arrow’s team. Since a home win against Middle Tennessee State, USA has lost four straight Sun Belt games. It’s now hit rock bottom, with two consecutive home losses to winless teams (UL-Monroe and Western Kentucky). So what does Arrow do from here? He’s got a good group of guards and an emerging post presence in Augustin Rubit, but South Alabama isn’t guarding well enough to win games. 1. North Texas (15-4, 4-2): One glance at the West Division standings shows North Texas two games out of first place. We’re not telling you to ignore the results on the court, but try to consider UNT’s body of work this season. Road losses at Middle Tennessee State and especially Troy are red flags, but the Mean Green’s work in the non-conference is proof that the two losses are an anomaly, not a growing trend. North Texas has serious issues defensively and got lit up by a red-hot Troy team that made everything it threw up, and this isn’t a perfect squad. But this same team beat LSU by 20 points on the road, beat Texas Tech at home, hung with Kansas for one half and has a roster full of NCAA Tournament experience. Don’t jump off the bandwagon because of two losses—and mark your calendars for a Jan. 29 showdown between Denver and North Texas. 2. Denver (10-9, 6-0): Denver is certainly not a pretender in this conference, not with a 6-0 record and a 74-36 beat-down of Arkansas State last night. The Pioneers are playing better than anyone in the league, and it’s not even close. Just how good were they last night in that victory? DU made 13 of 19 threes, forced ASU into 21 turnovers and held it to 17 points in the first half. And Denver even out-rebounded the Red Wolves, which is surprising because that’s not the strongest part of this team’s game. Denver still has to beat North Texas next week to prove it’s the outright best team in the West, but Joe Scott has this team rolling. It’s hardly the same team that limped to a 2-9 start and looked lost offensively. Scott’s offense, a Princeton-style system predicated on layups and threes, is a perfect fit for his personnel, and individually nearly every player is playing at a higher level. That’s true for freshman Chris Udofia in particular, who recorded a double-double against FIU and has established himself as a primary contributor on this team. Do note that Denver hasn’t yet been tested on the road; its only road contests in league play came at bottom-feeders WKU and ULM. 3. Arkansas-Little Rock (12-9, 4-2): After losing at UNT and Denver to start SBC play, Arkansas-Little Rock has done everything necessary to stay in contention in this division. The Trojans defended their home court—like they usually do—against three inferior opponents in Troy, Louisiana-Monroe and Louisiana-Lafayette. UALR then notched an important road win last night at Florida International (remember, this team didn’t win a road game last season). It’s easy to forget about the Trojans this season. After all, they weren’t very good last year, and Denver, FAU and North Texas get most of the attention in this league. Plus, Shields is known for his methodical, grinding style of play, and that’s not of interest to any fans. But Arkansas-Little Rock has quietly pieced together a solid campaign and has a senior-laden backcourt. The Trojans don’t have much size, but they’re scrappy and will put up a fight in this division. 4. Arkansas State (10-11, 4-3): It’s the kind of score that causes a double-take: Denver 74, Arkansas State 36. After a three-game winning streak, it looked like the Red Wolves were turning the corner. Last week, ASU dug a hole against Lamar in a non-conference match-up but rallied for a home win. Two months ago, it wouldn’t have completed that comeback—but Arkansas State was a new team. Right? After scoring 17 points in the first half against Denver, maybe this is the same ASU team after all. No players scored in double figures last night and John Brady’s normally stout defense allowed the Pioneers to shoot nearly 58 percent from the field. The good news is, ASU has a chance to correct things when it travels to North Texas Saturday. 5. Louisiana-Lafayette (4-14, 1-5): Centenary was just what ULL needed. Bob Marlin is having a rough first season: point guard Josh Brown is injured again, center Colby Batiste is off the team and the Rajun’ Cajuns have lost five of six Sun Belt games. That’s why a game against Centenary, which is in the process of moving to Division III, came at the perfect time. Louisiana-Lafayette played the Gentleman on Wednesday night and won by 32 points. Former Centenary guard David Perez, playing immediately this season because of that reclassification, scored zero points against his former team and missed all six shots he took. 6. Louisiana-Monroe (6-14, 1-5): The Warhawks lost at UALR by 31, at UTEP by 30 and at Stephen F. Austin by 24. So ULM’s 67-65 win at South Alabama was a bit surprising last week. Star guard Fred Brown scored 25 points in that victory. He’s playing more efficiently lately and has benefited from the development Tommy Sykes beside him. With a league win under his belt, coach Keith Richard can now focus his attention on a rivalry game this weekend. Louisiana-Lafayette and ULM will battle for second-to-last-place tomorrow, so throw out the records! In all seriousness, the winner will have a little momentum for the rest of the year, and the loser may be destined for dead last. It’s October. The leaves are starting to turn colors. Halloween candy is already in the stores. There have been a few nights where you may have even turned on the heat. Midnight Madness is imminent and RTC is full bore into the 2010-11 Season Preview materials headfirst. For the second October in a row, we’re bringing you our RTC Impact Players series. The braintrust has gone back and forth on this and we’ve finally settled on a group of sixty players throughout ten geographic regions of the country (five starters plus a sixth man) to represent the who and where of players you should be watching this season. Seriously, if you haven’t seen every one of these players ball at least once by the end of February, then you need to figure out a way to get a better television package. As always in a subjective analysis such as this, some of our decisions were difficult; many others were quite easy. What we can say without reservation is that there is great talent in every corner of this nation of ours, and we’ll do our best to excavate it over the next five weeks in this series that will publish on Mondays and Thursdays. Each time, we’ll also provide a list of some of the near-misses as well as the players we considered in each region, but as always, we welcome you guys, our faithful and very knowledgeable readers, to critique us in the comments. You can find all previous RTC 2010-11 Impact Players posts here. Chris Warren – Sr, G – Ole Miss. Returning from a torn ACL he suffered just 12 games into his sophomore season in 2008-09, Ole Miss’ Chris Warren had some folks concerned after his first game back last season when he played only 27 minutes, scored just nine points, and struggled with a 3-11 shooting night against Arkansas-Little Rock. Six days later, though, he and his fellow Rebels cruised down to the Puerto Rico Tip-Off in San Juan, where Warren scored 16, 27 and 24 points, respectively, in wins against Indiana and Kansas State and a loss in the final to Villanova. He averaged just under 32 minutes over those three contests and shot a combined 23-45, and, perhaps more importantly, put to bed any remaining fears about the status of that knee. Warren would go on to start all 35 games last year, average 32.9 MPG (tops on his team) and put up only two other single-digit scoring efforts for the whole season. His 17.2 PPG from last season means he’s the second-leading returning scorer in the SEC, trailing only Georgia’s Trey Thompkins by half of a point. When you hear numbers like this, it’s easy to forget that the guy’s doing all this as a 5’10 point guard, another testament to his toughness. Despite his role at the point, ignoring his outside shot isn’t recommended, either; he finished 14th in the nation with 3.4 threes per game, and led the SEC in three-point shooting in league games at 43.8%. Warren’s achievements earned him an all-SEC second team slot last year and we’re certain to see him on the Bob Cousy Award nominee list (again), and wouldn’t be surprised to see him as a finalist. If Mississippi is to return to the NCAA Tournament for the first time in nine years, head coach Andy Kennedy will need that kind of final season from his floor leader. 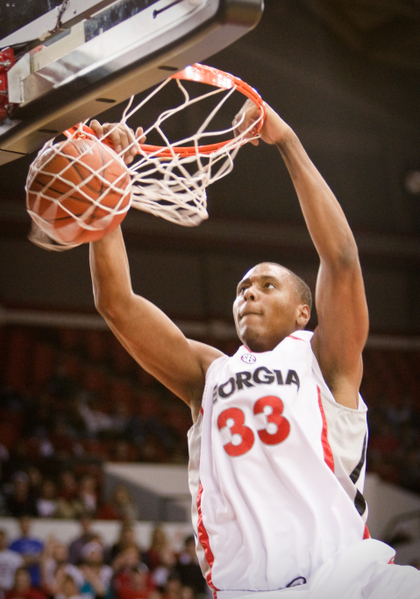 Trey Thompkins – Jr, F – Georgia. After toiling behind Florida and Kentucky for years in the SEC, Mark Fox has the Bulldogs poised for a resurgence. While many Georgia fans are focused on the recruitment of Kentavious Caldwell and Julian Royal this year, Thompkins along with Travis Leslie (below) could lead the Bulldogs back to the NCAA Tournament. After an exceptional sophomore season where he averaged 17.7 PPG and 8.3 RPG and briefly considered leaving Athens to enter the NBA Draft, Thompkins has a legitimate chance at being a 20/10 player this year, which is something that only Artsiom Parakhouski and Omar Samhan did last year and neither Radford nor St. Mary’s play in the SEC. Most NBA Draft experts already had Thompkins pegged as a borderline first round pick after last season and he should only improve on that as he continues to refine his game. With his combination of a solid outside game to match a developing inside game Thompkins has more than made up for his primary weakness—his relative lack of explosiveness—to become one of the top power forwards in the country. Unfortunately that was hidden from most of the country as the Bulldogs were buried on regional coverage as they managed a meager five SEC wins last season. If Leslie learns to translate some of that athleticism into a more complete overall game and Fox is able to get production out of freshman Marcus Thornton and transfer Gerald Robinson, the Bulldogs could be in the second tier of SEC teams this year just being UF and UK, but still in the spotlight enough that we get to see much more of Thompkins. Although you will probably see more of Leslie on ESPN’s highlight reel-laden recaps on television, if you look at the box score you will end up seeing that it is more likely that Thompkins did the majority of the hard work. Now that Patrick Patterson and DeMarcus Cousins have left Kentucky, Thompkins should be the top inside player in the SEC (at least until the NCAA figures out what to do with Enes Kanter) and has a chance to contend for SEC Player of the Year. Laura Hathaway of the Clarion is the RTC correspondent for the Sun Belt Conference. Western Kentucky. Player of the Week goes to Western Kentucky’s star player Steffphon Pettigrew. Pettigrew led WKU in two of their most recent victories, averaging 18.5 points and 6.0 rebounds per game. He was 11 for 16 from the field in the Hilltoppers’ win against Florida Atlantic last week. This junior is the second WKU player to be honored as Player of the Week. A.J. Slaughter has received the award twice already this season. Slaughter also has moved up on the list of WKU all-time scoring leaders. He has scored 1,219 points as of Jan. 9 and is 24th on the list. A statistic recently released shows that Western Kentucky is holding opponents to an average of 61.9 PPG in the friendly confines of Diddle Arena. Florida Atlantic. I’m not buying it that Florida Atlantic will remain second in the East Division standings. At halftime on Thursday night, the Owls were losing to the worst team in the conference, Arkansas-Little Rock, and they barely survived, coming back to win by only three. However, there is some positive Owls news: if Greg Gantt hits 14 more three-pointers he will break the team’s freshman record, and Raymond Taylor is most likely going to break the freshman and overall school records for assists in a season. Taylor is averaging 6.4 APG. Brett Royster is ranked 18th in the NCAA in blocks with an average of 2.9 BPG. South Alabama. The Jaguars snagged a big win against Troy on Saturday, winning a nail biter, 69-67. Head coach Ronnie Arrow has become South Alabama’s all-time win leader with 172. Freshman Martino Brock recorded his third double-double this season, and in doing so got a career-high 12 rebounds. Junior Gary Redus continues to miss games because of his right leg injury. Troy. Senior Yamene Coleman had a fine week last week, recording his fifth double-double and scoring 20 points against South Alabama. Twenty points is the most Coleman has ever scored against a Division I opponent. Point guard Michael Volger is 17 assists away from tying the school’s all-time leader in dime-dishing. Volger is also 21st in the NCAA in assists with 5.6 APG. Brandon Hazzard continues to lead the SBC in scoring at 18.3. Troy avoided a three-game losing streak by beating Western Kentucky on Thursday night, 77-69. Middle Tennessee. This team had 46 rebounds in one game against Florida Atlantic last week. That is a season high for the Blue Raiders. Senior Montarrio Haddock had his fourth 20-point game after a disappointing loss to Florida International last week. 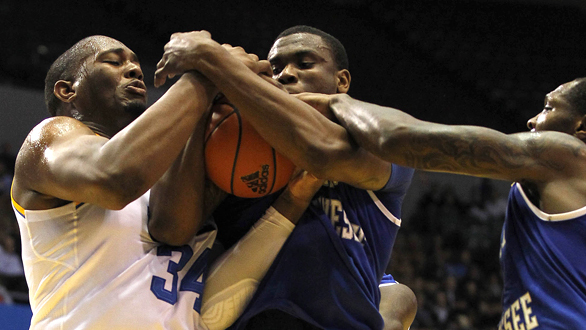 If Middle Tennessee lets games like that one slip through the cracks, the post season isn’t looking likely for them. A high note for the Blue Raiders was Desmond Yates’ 35 points against FAU. An interesting stat about Middle Tennessee is that as of Jan. 7, they are 23rd in the NCAA for free-throw percentage at 74.8% (BYU leads this category at 78.9%). Florida International. The Golden Panthers won their third conference game of the season last week, but that might end up as one of their last wins of the season. They do have a shot in Saturday night’s game against Arkansas-Little Rock, which should be a relatively easy home win. Arkansas State. The Red Wolves are pretty hot right now. They are definitely the team to beat in the West Division. That win against North Texas was big in more ways than one. Arkansas State scored its highest point total in conference play with 83 points. Freshman Brandon Reed led ASU against the Mean Green, putting up 18. Three other players on the Red Wolves scored in the double digits that game. Against South Alabama later that week, freshman Brandon Peterson swatted his 35th block of the season. Arkansas State is ranked 14th in the NCAA in three-point field goal defense. Denver. The Pioneers are second in the NCAA in field goal percentage at 51.9%. and 19th in three-point field goal percentage at 40.5%. Now, the bad news. Denver lost their weekend games in Louisiana to ULM and ULL. They just can’t cut it on the road. If Denver can beat South Alabama this Saturday they will extend their 11-game home win streak. Keep an eye on freshman Chase Hallam who had a career-high four three-pointers against ULM. Hallam leads DU by making 47.8% of his three-pointers. North Texas. Tristan Thompson did the most in helping the Mean Green get by Troy last week with his 21 points. Senior Eric Tramiel is back in the line-up after suffering a wrist injury and missing four games. During the game against Troy, Tramiel scored 11 points, then added 12 against Arkansas State. Fun fact: North Texas has won at least one game in 11 of the SBC’s 13 venues since the 2006-07 season. Louisiana-Lafayette. Well, my predictions from two weeks ago about Louisiana-Lafayette losing three of their next five games may be proven wrong. If the Ragin’ Cajuns win either of their next two games, I’ll have to admit that I was way off about this team. And moving up isn’t impossible for the Cajuns. They have maintained that middle spot in the West Division standings all season, while the three teams above them flip-flop around. Louisiana-Monroe. The Warhawks had a surprising victory over South Alabama last Thursday, 61-58. And then used that momentum for another surprising victory over Denver on Saturday, 64-53. ULM only missed four free throws against Denver, shooting 26-30. Senior guard Tony Hooper has 198 career-steals, putting him four away from the school record. Brian Spencer holds the record at 202, from 1985-88. New Orleans. Big news for UNO player Carl Blair, he is second in the NCAA for triple-doubles…with a total of one. Another UNO player with some noteworthy stats is Billy Humphrey who is 33rd in the NCAA in FT% at 88.3%. However, Humphrey was sidelined last week due to a knee injury. The Privateers managed to win without him, defeating UALR, 67-66, in overtime. If they hadn’t been playing the worst team in the conference that might not have been the outcome without Humphrey. UNO lost their 13th straight game in the Louisiana-Lafayette Cajundome on Thursday night. Arkansas-Little Rock. The Trojans finally won a conference game. Not saying much considering they beat Louisiana-Lafayette who also has a losing record. They unfortunately regained their usual form against FAU, dropping a close one, 77-74, to make it nine losses out of ten games. Sat., Jan 23 Middle Tennessee @ WKU 12 p.m. Sat., Jan 23 South Alabama @ Denver 5 p.m. Sat., Jan 23 Arkansas State @ Florida Atlantic 6 p.m. Sat., Jan 23 Troy @ Louisiana-Lafayette 7:15 p.m. Mon., Jan 25 WKU @ Southern Illinois 7:05 p.m. Thurs., Jan 28 Denver @ UALR 7 p.m. Thurs., Jan 28 North Texas @ WKU 7 p.m. Sat., Jan 30 New Orleans @ WKU 3 p.m. Sat., Jan 30 North Texas @ Middle Tennessee 7 p.m. Sat., Jan 30 Denver @ Arkansas State 7:05 p.m.